The Wilking Protocol uses the most basic essentials to human life. When we get the basic essentials in excess, our body uses them for its own well-being, and then flushes out their excess along with some retained toxins. Epsom is Magnesium Sulfate. Sulfate is a form of sulfur, and sulfur, is the 8th most common element in the body. Magnesium is the 11th most common element. Potassium, nitrogen, SALT, that is sodium chloride, are other natural essentials that have metabolic value to the body. Here is a graphic link of the most common elements in the human body. Drugs like Miralax, TYLENOL, Vaccines, and other Pharmaceuticals, 'medicines,' interfere with normal metabolic processes. Drugs are purposely made to interfere with metabolic processes. They are called xenobiotics, and that means foreign to the body. When xenobiotics are introduced into our body, we need to be able to detox them or we will pay the price. Xenobiotics are retained toxins. Many of us already have a lifetime collection of xenobiotics in our body, and we don’t need any more of them. Rather than buy a big corporation’s prepackaged solution, like a laxative, cold medicine, anti-fungal, anti-depressant, let’s learn the working of our own metabolic processes. Metabolic process are bodily processes as seen in this graphic-link, and they take place trillions of times every second. Interference with any of these processes may cause a ripple effect, where processes further down the line will not function properly. Drugs are designed to interfere with Metabolic Pathways. Mercury interferes with metabolic pathways. Adjuvants in vaccines interfere with metabolic processes. Drugs, mercury, and adjuvants are xenobiotics. The body has many, many detox pathways to carry mercury, and other toxins, xenobiotics, out of the body and brain. Whether it is sulfur-cysteine-based glutathione, RLA, neuromelanin, methionine, keratin, plain ol’ sulfur, or some other wonderful metabolic process, the body must detox from xenobiotics to properly function. Glutathione is made in numbers of cycles in our bodies. They are sulfur based Cysteine, Methionine, Homocysteine, Glycine, and many others. If a xenobiotic, or deficiency interferes with one of these cycles, we may continue to function, but we may not function very efficiently. If our body gets enough sulfur, it can use other forms of sulfur to run its processes. In other words, it doesn’t have to start breaking apart glutathione to make RLA, and/or breaking-up RLA to make glutathione, or tearing apart some other essential like keratin because it is short of a ‘part’ to function. Here is an analogy to explain it. Before reading this, make sure you looked at the graphic of the metabolic pathways. 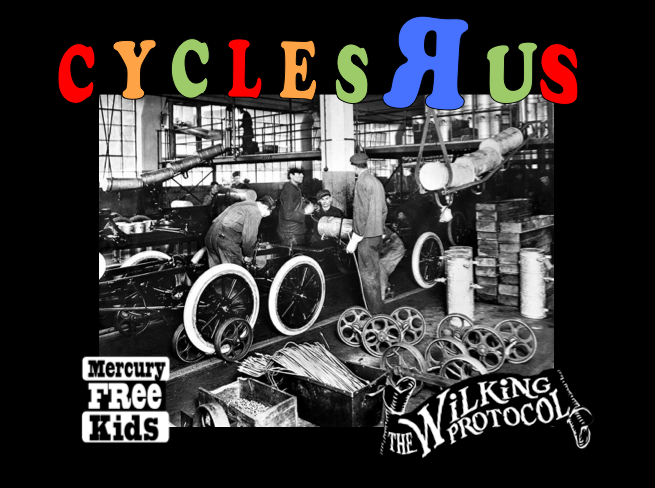 Cycles-R-Us has individual assembly lines and departments that make specific products, mainly unicycles, bicycles, and tricycles. Let’s say the wheels of a bicycle, unicycle, or the front wheel of a tricycle is a ‘big wheel’, and that it represents a sulfur atom. Let’s also say that the bicycle department has had a backlog of bike frames because they have had no large wheels to finish their product. The tricycle department, only needing one large wheel per bike, has been working at an even pace for some time. The bicycle department has grown worried about being laid off. The workers ask one another, “When will the new shipment of ‘big wheels’ arrive?” They watch the receiving dock everyday. When a large truck arrives with lots of ‘big wheels,’ the staff of the bike department runs to the truck, and takes every wheel in the shipment for themselves. The assembly line of the bike department then sends all their now finished bikes to the loading dock for shipping. However, the tricycle and unicycle departments have run out of ‘big wheels.’ Finding the finished bicycles, the trike department says to themselves, “We need big wheels! The bike department took all the big wheels! We’re taking them back,” and they start tearing the bikes apart so they can finish their own backlog. This may sound funny, but when we are short in essentials, this kind of thing happens all the time. Using our essentials to detox a constant source of xenobiotics, we can run short in ‘big wheels’ (essential sulfur or other nutrients). It can be incredibly debilitating for the morale of the Cycles-R-Us workers, the cells of our bodies, as this back-and-forth requires an enormous amount of energy, and is extremely inefficient. The more xenobiotics (retained toxins) a person has, the more deficient in essentials, the more likely they will have these kinds of dysfunctional body systems. We may know what is going on in our bodies, we feel it, we may not know the exact causes, but this can be incredibly debilitating to a person, this constant in-fighting. We are stuck with the body we have. However, western healthcare can sell you some new body parts if your xenobiotics have overwhelmed your natural detox systems. Regarding xenobiotic detoxifiers: Supplemental glutathione, ALA, or any other man made product can push us toward injury. I’m not saying that a person can not be helped by supplementing them, but it is really important to understand how the body can react, if the detox systems are not ready for the fallout, for either the moving of large amounts of toxins, or the residual oxidized products call ROS. Taking supplemental glutathione, ALA , DMSA, DMPS, or another kind of chelator or prefinished/prepackaged supplement can cause oxidative injury. There is a good amount of misinformation being spread around about ALA, with the story that ALA is the only thing crossing the blood brain barrier to carry mercury out of the brain. It is an egregious lie that ALA is the only supplement that will carry mercury out of the brain. I wish those perpetuating the lie would stop telling it. Supplemental ALA is synthetic; it is man made, and it is a xenobiotic. It is an unnatural form of Lipoic Acid to the body. The natural form of Lipoic Acid is RLA, and our body makes the exact amount of RLA it needs when we have enough essentials for the body to make it, when there are enough ‘big wheels,’ sulfur, to go around. RLA made by our own bodies is an essential to our well-being; ALA is not.